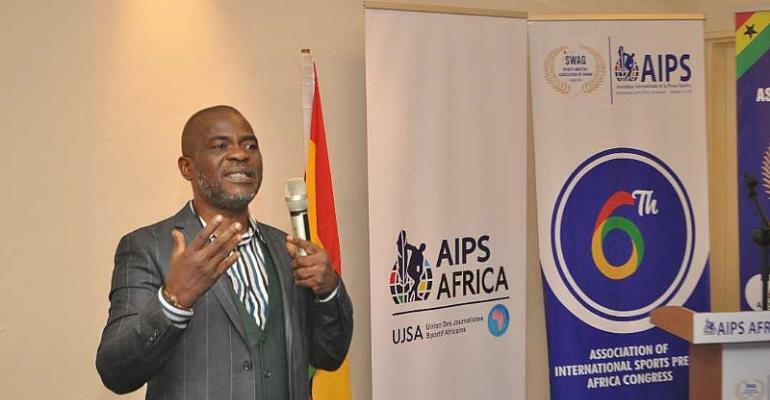 The Africa section of the International Sports Press Association (AIPS Africa) held its 6th congress in the Ghanaian capital of Accra from April 3rd to 6th and came out with the following resolutions. - Building on the decisions reached at its last meeting in Lausanne during the AIPS Congress which witnessed the first AIPS SPORT MEDIA AWARDS. - The congregation of sports media leaders again reiterated the importance of National Sports journalists Associations across the continent to fashion out programmes and events that will impact hugely on its members in terms of value thus stimulate and enhance the acquisition of AIPS cards which now command an unmatched recognition and respect globally. - Going forward the delegates agreed that Associations with no fewer than 20 cards will not enjoy the full range of AIPS and AIPS AFRICA 's support. - Inspired by the diligence shown by the host; the Sportswriters Association of Ghana (SWAG), the assembly registered its deep appreciation for the hospitality and successful conduct of the three-day event and notably congratulated SWAG on its 50-year anniversary celebration which hits its climax next month with the Awards ceremony. - The impressive launch of the second edition of the AIPS SPORT MEDIA AWARDS in Accra was acknowledged not only as a fitting salute to the strength in store of talents in the continent but also as an abiding faith by the AIPS leadership to support and promote easily a significant development in the chequered history of the global body. Members hailed this encouraging disposition and fervently appealed to all professional sports journalists to key into the drive to participate and showcase their works beyond the ordinary limits of exposure. - Tackling challenges of today’s Sports Media: the congress advised its members across the globe to conduct themselves in a professional manner by staying factual and balanced in their reportorial output . They were also asked uphold their integrity and independence of thought at all times even as they forge ahead in unity of purpose to counter forces that strive to marginalize their critical presence in major and national sports events. - Besides advocacy for sports media rights, issuance of identity cards at national and international games, organizing training programmes for young sports journalists and planning to organize sports awards to honour excellence, the continental gathering shared the sentiment of Ghana’s Sports Minister Isaac Kwame Asiamah of the crucial need to mount consistent education on the benefits of Sports to mankind especially as an ENABLER in meeting the Sustainable Development Goals (SDG) and highlighting the power of sports journalists to set the agenda and spearhead the crusade against the demons of doping, match fixing and corruption that combine to undermine clean sports. - Encouraging the collegiate spirit and dialogue within national associations, the congress asked members in countries with division in its rank to seek ways and openings to shun their differences and come together in a united front to strengthen their involvement and participation in AIPS and AIPS Africa. The progress of a united body in Mali and the inspiring intervention of Mall’s Olympic Committee President Habib Sissoko was well noted and applauded just as the effort of the Cameroonian Communication minister and other leaders of sports in finding an enduring unity among Cameroon Sports Journalists attracted commendation. - As the All Africa Games and Olympics Games beckon, the congress lauded the bold drive of the new leadership of ANOCA (Association of National Olympic Committee) in Africa) to set up ANOCA 2020 Commission to spearhead Africa’s preparation and successful participation in the Tokyo Games. - The ANOCA Zonal Youth games: The delegates noted it is a milestone initiative and aligns well with the lifting benefit of catching and exposing the youth. Notably, the partnership of ANOCA and AIPS AFRICA featured prominently in presentations and discussions aimed at fashioning out a strategic development and promotion blueprint for the continent’s sportsmen and women. The new dispensation of ANOCA leader Mustapha Berraf got plaudits not only for the proposed training camp for all the African teams to the Olympics but also its detailed plan to organize the first All Africa Games that will feature no fewer than 17 qualifying events for Tokyo Games. - AIPS AFRICA appreciated the Moroccan Sports Minister for sending a brilliant team to the congress and for the landmark act of considering the continental sports headquarters in Casablanca as one of the media centres for the continental games in August. With this relationship, it is assured that sports journalists for the games and any other visit will have a conducive hub to do their work and share in the good fellowship of colleagues in their own building. - As the congress delegates look ahead to a beautiful Game, good attention was also drawn to the lingering inability of the Moroccan agency Marocaine Des Jeux et Des Sports MDJS, to fulfill its contractual obligations to the continental Sports Journalists body in the last three years despite several reminders. The delegates resolved to explore all options available to ensure that MDJS respond effectively to the terms of the partnership it freely signed and celebrated with AIPS AFRICA in Casablanca. - Finally the delegates thanked all those who helped make the Congress a roaring success by their presence, support and prayers and reserved a moment of praise and felicitation to the Power Of Sports in AFRICA Barrister Nyesom Wike, the governor of Rivers State of Nigeria for his emphatic success at the polls, giving him a well deserved mandate for a second term in service to a passionate sports populace.